I am totally late to the party in the sense that I have never tried a single product from Deciem. I am sure many of you have at least heard of them before, or perhaps tried a product or two from their many skincare brands. If you're not totally aware of them, Deciem are renowned for being creators of effective but affordable skincare, which you can appreciate, especially if you're not one to splash the cash on high end products. 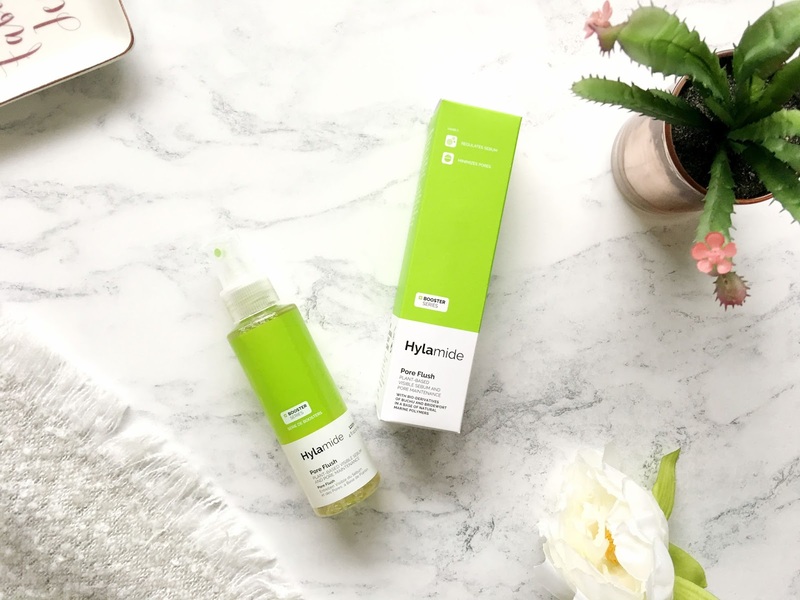 One of the many brands from Deciem is Hylamide, consisting of three series of skincare products, the Core Series, Booster Series and the Finisher Series. The combination of the three series will create a skincare routine for you which is dedicated to work for your skin type. I have been using the Pore Flush Booster for the last couple of months but I've only got around to talking to you about it now. I'm surprised it's taken me so long as I've really been enjoying it. It is described as being a plant and marine-based formula mist formula that helps to visibly reduce pore size and sebum overactivity. I have combination skin which means I can get quite oily in my t-zone and drier on my cheeks. I am also prone to acne breakouts and I have enlarged pores on the left side of my face. It's like it was made for me. The formula consists of the following technologies; Bridewort Bioderivatives, Buchu Bioderivatives and Natural Marine Polymers. Bridewort Bioderivatives- A biotechnology derivative that acts as a solubilizer of congestion within pores to flush them out. Buchu Bioderivatives- Helps to reduce visible sebum accumulation within pores which can cause the pores to look enlarged. Natural Marine Polymers- Forms a natural, non-clogging marine-derived film to tighten the pores immediately and visibly reduce sebum even further through a different pathway than that offered by the other technologies within the formula. Packaging wise, I was drawn in straightaway, it's extremely eye catching. Within the striking lime green box is a bright lime green bottle. The bottle has a spray top which you can then spritz all over the face or on a cotton pad, whatever you prefer. I like to spray it directly from the bottle onto my face both day and night before applying the rest of my skincare. The mist isn't exactly light, nor is it too heavy. It more or less covers your entire face with just one spritz, but I quite like that. There is a very noticeable strong, fresh scent when spritzed which admittedly I wasn't very keen on at first. Once I had used it multiple times I got used to it and actually found it to be quite refreshing. It takes at least a minute to fully soak into the skin, at which point I could feel my skin tingling and tightening up. That's the moment I knew it was working for me. It takes a while to visibly see a difference though. The results are not instant. It was at least a few days before I noticed any improvement in my skin after continued use. My pores were somewhat smaller, though they hadn't completely disappeared and I wasn't as oily as I usually was in my t-zone. I wasn't breaking out as much as I usually was either. I would normally have a new spot pop up at least daily and this became less frequent upon using the Pore Flush Booster. I have absolutely loved using this. I wouldn't say it's a miracle worker but it has improved my skin to no end. You can purchase the full size(120ml) bottle from Deciem for £13. Have you tried the Hylamide Pore Flush Booster?